Hubby discovered this event while trolling the Internet a few weeks ago. We had already made plans to be in the County Durham area during that weekend …. yes, of course, I want to go! Master classes … celebrity chefs … local artisan foods … everything that I could learn from and use for my new blog and ultimately my new specialty foods café. Who knows, maybe Mary Berry or Paul Hollywood would be there. If not, then maybe one of the contestants from the Great British Bake Off. I did my research, downloaded the map, the schedule of events, and was ready. We took a drive to Bishop Auckland the day before just to get the ‘lay of the land’. I certainly didn’t want us to get lost, or not know where to park. As we drove along the highway into Bishop Auckland, the flashing signboards were up warning us to “expect delays” because of what was expected to be thousands upon thousands of foodies descending on the town. We talked to relatives who kindly offered their driveways, knowing that we’d be driving around for hours trying to find a spot to park the car. Off we set on Sunday morning. A typical English day, cold, damp, and grey, 8° C (about 46° F). The drive was uneventful. Parking (thank you Morrison’s) was not a problem. Walking to the town square was brisk, but quiet. Where were all the people? I was ready to battle the crowds. We saw the first of the white canopies, then more, then row after row of folding chairs, and a stage platform. But where is Mary Berry? 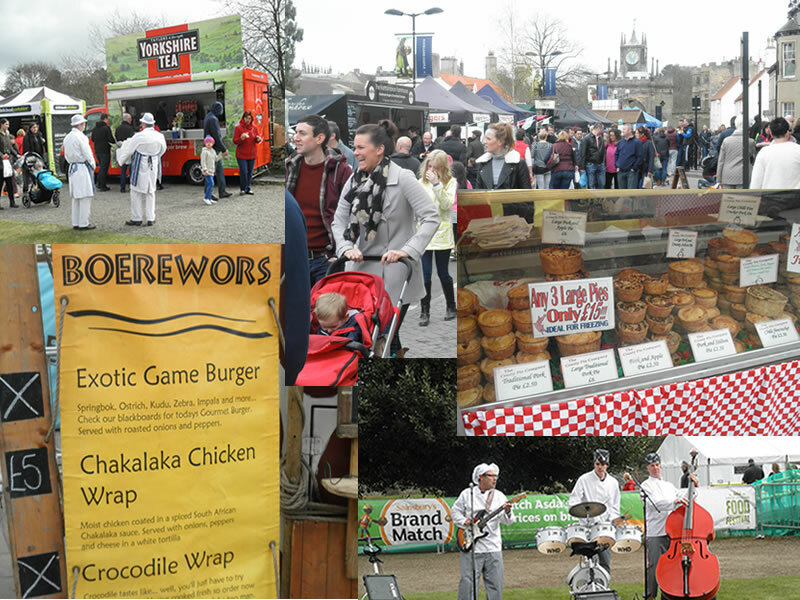 As we made our way through the market square down past the canopied vendors to Auckland Castle where the main event was to take place, finally, people!! The day began to brighten and so did my attitude. Look there’s a vendor selling Millionaire’s Shortbread and it LOOKS JUST LIKE MINE!! Pies ….. steak and stilton, pork and apple, cheese and onion, traditional and exotic. They were all here! Scones …. cheeses …. breads ….! We sampled everything we possibly could from Spanish Paella to 6-month aged Bleu Cheeses. We drank hard ciders, homebrewed vodka, and, of course, tea. There were traveling troubadours singing the praises of ‘tomatoes’, squawking seagulls to entertain (and annoy) the children, foods from all over the world. Did I read more into this event than it actually was? Probably! But, did I enjoy it? Absolutely! !